With graduation less than a week away, the President Emeritus of Lake Forest College was trying not to panic. He’d had an especially difficult time organizing the ceremony that year, and he’d just received word that the scheduled commencement speaker for the class of 1977 was refusing to give a speech. “I talk with people, not to people,” insisted Theodor Geisel, better known by his pen name, Dr. Seuss. The renowned author and illustrator had misunderstood Lake Forest’s invitation, believing the college intended to award him an honorary doctorate—which it did, but with the polite understanding that honorary degrees are the usual currency for graduation speeches. Seuss told President Hotchkiss that he was completely unwilling to address the eager students with anything more than a few words of thanks. He did not, he felt, have any useful advice to offer them. To Hotchkiss’s great relief, Seuss reached into his gown and pulled out a scrap of paper. Despite his capitulation, however, Seuss hadn’t really changed his mind about the value of his own advice: the title of his speech, “My Uncle Terwilliger on the Art of Eating Popovers,” secretly alluded to the most devastating, colossal failure of his career. The story of Dr. Seuss’s metaphorical Uncle Terwilliger began in 1952. At that time, Seuss’s resume still lacked such bestsellers as Green Eggs and Ham or The Cat in the Hat, but it did boast an impressive 14 books, three Caldecott Honor awards, and dozens of successful plays, poems, and songs for radio. Most recently, the 48-year-old author had won an Oscar for his first animated short, Gerald McBoing-Boing. Encouraged by this success, Columbia Pictures offered Seuss a contract for a feature-length, live-action musical with a budget of more than $2 million—an amount usually reserved for Disney juggernauts like Alice in Wonderland or Cinderella, and equivalent to roughly $20 million today. Such dark dialogue was balanced by a traditionally Seussian take on costumes and scenery, plus a lively score of 24 songs by the esteemed composer Frederick Hollander. 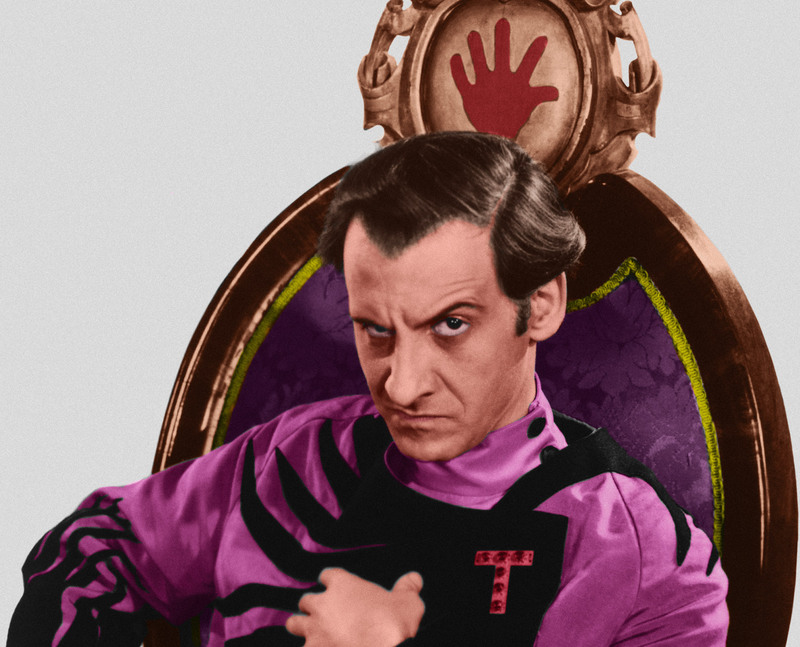 Seuss titled the picture The 5,000 Fingers of Dr. T, and he knew exactly who he wanted to play his melodramatic, foppish lunatic: a character actor and old friend named Hans Conried. In his biography, Conried admitted to being a fan of Seuss even as a teenager in the 1930s. By then, however, Hitler had begun his march across Europe, and both men soon set aside their burgeoning entertainment careers in favor of the war effort. Conried took a tour of duty on the Japanese front, while the older Seuss churned out hundreds of biting political cartoons, military training manuals, government newsreels, and live-action films. This decidedly un-whimsical interlude in their lives prompted their first collaboration. In 1947, Seuss wrote Design for Death, a postwar pseudo-documentary cobbled together from footage confiscated from Japanese officers during their surrender. The bombs had ceased, but the psychological trauma of war remained. The film tried to explain to the still-recovering public just what had gone wrong within the enemies’ minds and borders. (Its hamfisted message of prevention can be largely summed up as, “Run your country like America, instead of like Japan.”) Narrators of Japanese ancestry were available—and most were desperate for work, having been only recently released from their internment camps on American soil—but producers hired Conried to imitate the accent instead. As Conried noted later, his overdramatic vocalizations probably served the producers’ political aims better than a native speaker would have. Neither man felt especially proud of the film in their later years. Seuss said in his memoir that he believed all copies had been destroyed, though at least one is stored in the Library of Congress, while Conried claimed that it had only been shown in theaters five times, which was the minimum to be eligible for an Academy Award. Surprisingly, it won that year for Best Feature-Length Documentary—though as a 1948 New York Times reviewer put it, “Apparently competition in that category was nil.” But both Seuss and Conried cherished the friendship it had sparked, and they crossed paths regularly over the next four years whenever one of Seuss’s books or poems was ready to be dramatized in the recording booth. Thus, by 1952, Conried was not just Seuss’s first choice for the role of Dr. Terwilliker; he was his only choice. Not everyone agreed with Seuss’s vision. The film’s producer, Stanley Kramer, initially offered the part to comedian Danny Kaye, but Kaye had a grudge against the president of Columbia Pictures and refused to work for the studio ever again. Further delays occurred when Bing Crosby passed on the co-starring role of Dr. T’s plumber, Zabladowski, despite several songs being written with him in mind. Conried had never sung or danced on screen before, and his admittedly lengthy list of credits consisted mostly of waiters, head waiters, and maître d’s—but with major characters still uncast and production already underway, Kramer had no choice but to accept Seuss’s recommendation. In the end, the only cast member with any real star power would be nine-year-old Tommy Rettig, who debuted on Broadway at the age of five and would later go on to play Lassie’s owner in the long-running TV series of the same name. Conried quickly adopted a routine of facetious irritation with the young celebrity, and playfully aired his mock grievances to the press. “The little villain knew every line of dialogue,” Conried grumbled, “and everybody’s lyrics.” Rettig, by all accounts a humble kid who disliked the trappings of fame, seemed to appreciate the joke, and delivered plenty of thinly-veiled compliments in return. Of the actress playing his mother, Rettig whined, “She just stands out there in that pretty dancing costume, and the first thing you know everyone on the set is looking at her. I’m afraid the audience will, too.” Seuss, for his part, delighted in Rettig and all the other children on set, and spent his spare time drawing personalized sketches for them. “This Earth has 20 trillion kinds of problems to be solved. When it came to the subject of nuclear war, Seuss clearly had more to get off his chest. Even the stage directions were rife with symbolism, as when Dr. T “stares at the ceiling in Hitlerian anguish.” Other references reflected more general postwar realities, such as Zabladowski’s complaint that Bart is too needy to look after. “In the middle of the night you’ll start sneezing, then you’ll start coughing. You may even come down with a case of pneumonia—at a time like this, with no penicillin!” Supplies of the drug were so tight in the early 1950s, thanks to soldiers’ wounds and outbreaks of sexually transmitted disease on the former battle fronts, that a thriving black market arose in most of Europe. Vials of penicillin (both genuine and fake) were a de facto currency in the hardest-hit cities. But it wasn’t all grim metaphor. The money that Zabladowski so desperately craves is, he explains, paid in Pastoolas—equivalent to 44,000 Kratchmuks, each worth 3 silver Zlobecks, which in turn break down into 59 Drachmids. Another scene, cut from the script before filming, explains that sinks can only be removed according to the strict guidelines of the International Congress of Associated Sink-Taker-Outers, “which include adjusting the Cantalator, affixing the Grokkin, turning the Hoogle-span, and giving half a revolution to the Oscillating Ding-Ding.” This was, after all, a Dr. Seuss film. Not all of the mature content survived. In addition to being cut for length—Seuss’s original script ran 1,200 pages, ten times as long as a standard Hollywood offering—large portions were rewritten at the production company’s insistence. Dr. Terwilliker originally had a penchant for cutting off heads, for example, and died at the end of the movie by strangulation, clotheslined by the Twin Guards’ conjoined beard. In the final version, he is simply carried off to the dungeons. Meanwhile, one of the more sinister pieces, “The Elevator Song,” made it all the way to production, but had the third verse removed after the studio decided it crossed the line from gruesome to offensive: as Terwilliker escorts Bart down to the lowest level of the dungeon, his elevator operator sings a pun-filled song about the tortures available on each floor, including neck chains in the “Jewelry Department,” and electric chairs under “Household Appliances.” But the third floor also included gas chambers, which was deemed insensitive in light of the recent atrocities overseas. Given Seuss’s outspoken political beliefs and clear use of symbolism elsewhere in the film, the allusion was almost certainly deliberate. Despite the many rewrites, however, the final script was inarguably grandiose. One instrumental dance number called “The Dungeon Ballet” featured dozens of operational, larger-than-life instruments straight from Seuss’s imagination, including a four-man hookah with plungers, a mannequin strung like an upright bass, violins that wrapped around their players’ heads entirely, and a 20-foot-tall harp arching across the room. According to Hans Conried, actors and crew from other movie productions would drop by the studio on a daily basis just to watch the sprawling rehearsals. To be fair, the version that reviewers ultimately saw had little in common with the one Seuss and the others had worked so hard on. The film’s initial test screening had been a dismal failure, with some audience members walking out after the first 15 minutes. Seuss claimed there were five people left in the theater by the end, while Conried remembered only one: a little boy who couldn’t leave because his mother hadn’t arrived yet to pick him up. Some blamed Columbia Pictures for marketing the film to a younger group than Seuss intended; others accused uptight parents of dragging their wholly-entertained children out against their will. But producer Stanley Kramer couldn’t afford to entertain such justifications. The crew’s confidence had loosened Columbia Pictures’ pocketbook, and Kramer was now roughly $1 million over budget—almost $10 million adjusting for inflation—and staring down the possibility of the biggest flop in history. Oh me, oh my, oh me! Unsurprisingly, the film failed at the box office. Seuss and several others blamed Kramer, but Tommy Rettig recalled that even in its altered state, the screenings he attended were full. “All I know is that it seemed very strange to me,” he said. “It wasn’t like it played to empty theaters or anything like that. We had crowds everywhere we went.” By the time the film premiered, Rettig was working on his next project, River of No Return, and his co-star Marilyn Monroe attended the opening night of The 5,000 Fingers of Dr. T as his date, alongside many other celebrities of the day. Whether Cohn had a personal role in Dr. T‘s box office failure can never be known for sure, but in 1958, Columbia Pictures seemed to have a change of heart and re-released the film under the new title Crazy Music. Once again, however, it was marketed to the wrong crowd, this time as a collection of “hip tunes” to compete with the rock-n-roll movie mania sweeping the nation. From just 1956-1959, more than 50 of these genre films were released, roping in such unexpected performers as Charlie Chaplin, poet Maya Angelou, and, of course, eternal bit player Hans Conried. During that odd but brief cinematic bubble, it must have seemed like anything with a soundtrack could sell… except this one. The Elvis Presley demographic preferred drive-ins and beach parties over rhyming, dystopian monocrats, and The 5,000 Fingers of Dr. T bombed for a second time. Nonetheless, Conried’s wry sense of humor emerged intact, and in less than two years, he was back to his old self—first playing an uncredited barber in a Dean Martin and Jerry Lewis comedy, then a heartless department store manager in a 45-minute television remake of Miracle on 34th Street. Eventually, his granules of credit amassed into a landslide of respectability, and in 1960 he was awarded a star on the Hollywood Walk of Fame. Other Terwilliker-tainted careers survived as well, though none quite so prolifically. Peter Lind Hayes and Mary Healy went on to star in their own semi-autobiographical sitcom about a married Hollywood couple who must adjust to rural life, and Stanley Kramer’s next project was the seven-time Academy Award-nominated film The Caine Mutiny. Child star Tommy Rettig landed the lead in Lassie on the recommendation of animal trainer Frank Weatherwax, who liked how Rettig had interacted with the pet dog in Dr. T. Meanwhile, one of the dancers in “The Dungeon Ballet” was a struggling young actor named George Chakiris. He later told an interviewer that he used that paycheck to join the Screen Actors Guild, which eventually led to an Oscar for his portrayal of Bernardo in West Side Story. And then, of course, there was Dr. Seuss himself, who followed his “debaculous fiasco” with the blockbuster classics Horton Hears a Who, The Cat in the Hat, How the Grinch Stole Christmas, One Fish Two Fish Red Fish Blue Fish, and Green Eggs and Ham, all in a span of just five years. Among these and his many later books, only Horton Hears a Who contained any lingering hints of World War II symbolism: according to Seuss, it was an allegory for the Hiroshima bombing, and a largely apologetic one at that. Perhaps the cold reception of The 5,000 Fingers of Dr. T had finally gotten it out of his system, or perhaps the film’s editing-room hatchet job had simply convinced him that his message was doomed to meddling and misinterpretation anyway. He did eventually reintroduce a few social issues into his children’s books, such as anti-racism in The Sneetches and pro-environmentalism in The Lorax, but for a man whose work turned so heavily on war politics even eight years after the Allied victory, it’s hard not to search for a cause to its abrupt end. Seuss never softened on the final version of the film before his death—nor did he have anything to say about it after his death, despite his promises. Yet even with everything that was altered, rejected, and lost, the spirit of Seuss lives on in what remains, and some piece of the original evidently kept its place in Seuss’s heart as well. With a total of just three stanzas, Seuss’s poem is generally considered to be the shortest commencement speech ever given. School administrators later carved his 30-second nugget of rhyming wisdom into a stone memorial, which remains on the campus of Lake Forest college to this day. Written by Jennifer Noonan, copyright © 06 November 2018. Jennifer is the author of "No Map to This Country." She lives in Austin with her husband, four children, and their pet tarantula, and can be found online at jenniferisacommonname.com. Podcast sound design by Alan Bellows. Podcast narration by Jennifer Noonan. Edited by C.H. Hung. First and interesting as always. Growing up this movie scared the sh@# out of me. And be careful what you swallow… Excellent as always! Comparing the budget to Cinderella is a little misleading because animation is such a laborious process; a more apt comparison is that the budget is almost exactly the same as The Wizard of Oz. Thank you for this introduction! Have been a huge Dr.Suiess fan since before I could read. However‚ have never known of his films and these contributions until now. This was one of my favorite movies decades ago, and it still is. However, I never knew the history associated with it, and I now wish that the movie that had been made was the one that was originally intended. Tremendous article! Ms. Noonan, you are an astounding writer. Always good to read that a couple of favourites were friends as well as professional colleagues — I had no idea that Geisel/Seuss even knew Hans Conried, of whom I was also a fan, even before his Snidely Whiplash days. Funny that for as long ago as that was, now, I had no trouble whatsoever in remembering exactly what he looked and sounded like. Of Dr Seuss, of course, I’m sure everything that could have been said about him has been said by now, but I stand in absolute awe at his ear for the rhythm of what for him was a non-native language. Sorry, but I’m lost. The Good Doctor was born in Springfield, Massachusetts. Why do you say English was a non-native language? What did I miss in the article? Regarding lingering hints of WW2 symbolism, he didn’t leave the horrors of war behind. His “The Butter Battle Book” was published in 1984 and is an allegory about atomic/nuclear weapons, the futility of mutual destruction, and how nationalism can lead to horrible consequences over trivial things. Could I ask for a miracle, silly though that it could be, that folks read and understand those stanzas before they tweet? This film mesmerized me when I watched it on TV as a child. Saw a pristine copy on the big screen as an adult and was disappointed by the rather lame content, but the stunning, imaginative imagery was as dazzling as always.